Some houses were damaged by falling trees in Newman Grove. 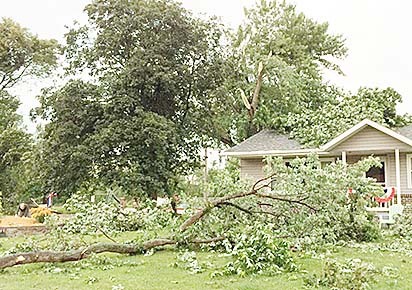 A relatively brief morning storm on Thursday, June 28, caused crop and tree damage stretching from Raeville and Petersburg east to Newman Grove. Citizens reported extreme wind gusts, along with some hail, that flattened cornfields and broke off some corn plants. The storm struck mostly between 7 and 8:30 a.m. Thursday. Tree damage was extensive throughout Newman Grove, where downed trees and branches littered most streets. The home of Doug and Lynda Pospisil was one of those with roof damage from a fallen tree. The north portion of the city was without electricity for several hours due to broken power poles and downed lines. 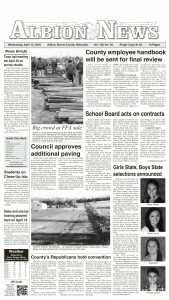 Power was still off at 3:30 p.m. in the northeast portion of Newman Grove. 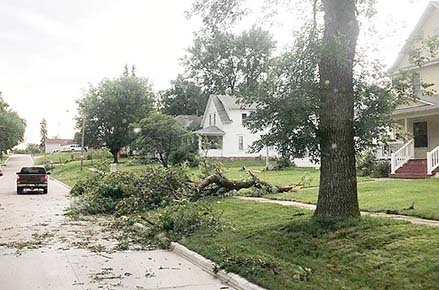 This photo shows typical tree damage along Newman Grove streets Thursday.